Game Of Thrones has been selective about official music selections during the series. The National performed “The Rains Of Castamere” for the second season soundtrack, and the upcoming third season music compilation has The Hold Steady’s version of “The Bear And The Maiden Fair” and Kerry Ingram’s (Stannis’ daughter Shireen Baratheon, also of Matilda The Musical in London) “It’s Always Summer Under The Sea.” But the musical associations with the series got a bit wider after last Sunday’s episode. 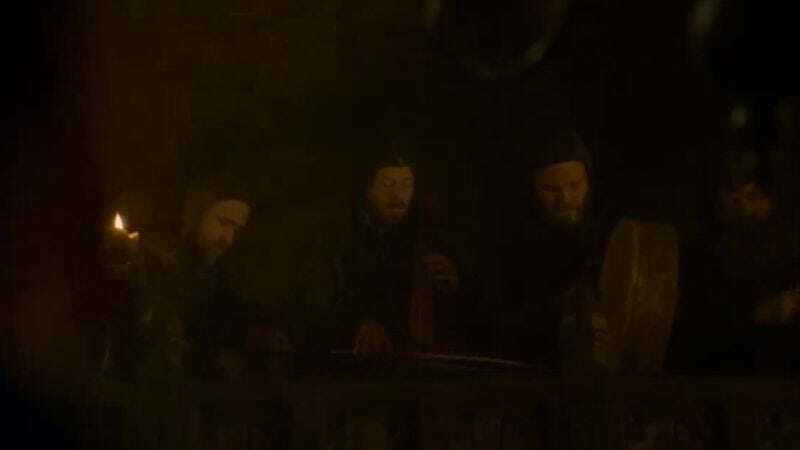 Coldplay drummer Will Champion made a cameo as a drummer at the Red Wedding—an appearance that we reported back in November. Just as the band begins to play “The Rains Of Castamere,” out of place as a Lannister victory song at the wedding, there’s Champion, concentrating on that one drum, trying not to start playing “Viva La Vida” or something. It’s not the first time a musician has made a cameo on the show—Snow Patrol’s Gary Lightbody sang “The Bear And The Maiden Fair” with the group that captured Jaime and Brienne back in “Walk Of Punishment.” You can watch a clip of the first shot Champion shows up in during the bedding ceremony below.